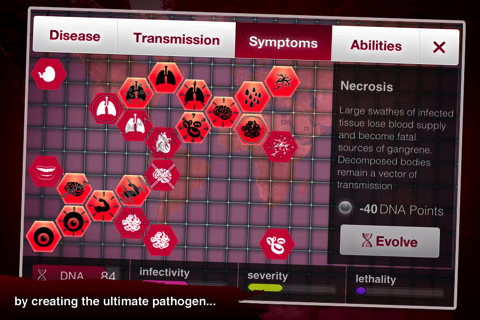 If you like movies like Contagion or board games like Pandemic you’ll love the Plague Inc. app for iPhone and iPad from Ndemic Creations LTD. Your goal in this game is to infect and kill the world with a disease that you create, mutate and evolve into a worldwide deadly plague while racing against the cure. This game is all about strategy and takes dedication, patience and some time if you want to win; it’s no quickie. Plague Inc. is an intricate game that takes nine screens of instruction, but don’t worry it’s easy to learn as you go and overtime you’ll learn your own strategy. The game is set up in levels by type of pathogen and you have to win a game with a first level pathogen before you can move onto juicier ones. To start the game, you pick a country of origin for the infection (hint: pick somewhere with ports and airports- easier to spread). As the infection spreads you’ll receive updates and useful news feeds that help you decide how to evolve your disease. Pay attention to these as they’ll give you clues as to how to evolve your disease to take advantage of world events. You earn ‘DNA’ points as the infection spreads by popping little balloons that appear. Stock up on these points, they’ll help you buy modes of transmission, symptom mutations and ability traits to make your disease even more lethal. 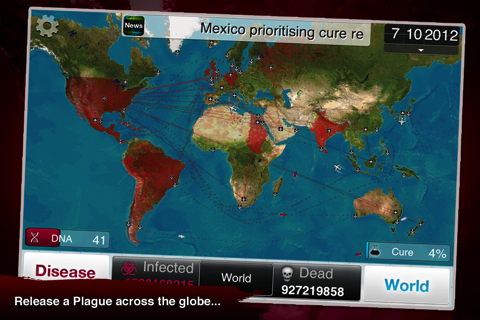 Once the entire world is infected, it’s game on. Symptoms start to slowly spread worldwide, coming to the attention of the authorities who start to develop a cure. Here’s where strategy comes in. You must make your disease deadly enough that it kills the entire world before a cure can be developed 100%. Save up those DNA points, because this is where you’re really going to need them. It’s a race against time as you try to strategize how you use your points, evolve your disease and beat the cure research. The details in the Plague Inc. iPhone game are what make it stand out. The graphics are awesome and crisp. The world map looks like a real topographical map and as the infection spreads, red menacingly spreads across infected countries. You can see how modes of transportation spread the disease because the game shows air and sea travel paths. When you see a red ship or airplane moving across your screen you know your disease infection is spreading. You can look up the infection and death stats worldwide or by each country when you highlight any place. Graphs of the world, disease and cure show you the progression of each. All of this it set to a soundtrack of ominous electronic music that gets you in the mood to infect the world. AppSafari review of Plague Inc. was written by Sally Pope on July 17th, 2012 and categorized under App Store, Featured, Games, iPad apps, Strategy, Universal. Page viewed 4520 times, 1 so far today. Need help on using these apps? Please read the Help Page.